Teacher, Asst Sub Inspector, Fitter, Chemist and Supervisor Jobs. 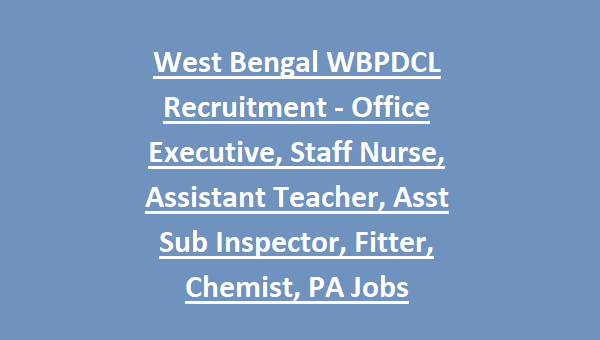 There are total 326 vacancies are in this WBPDCL Recruitment 2018. Online applications are available from 01-10-2018 to 16-11-2018. 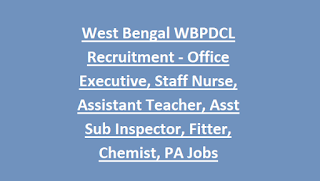 Official website to apply online for this WBPDCL Jobs is www.wbpdclonline.com. Post wise selection process, exam pattern and syllabus, how to apply online and other details of this WBPDCL Recruitment Notification is updated below. For all the posts upper age limit as on 01-10-2018 is 32 years. For Assistant Sub Inspector posts upper age limit is 37 years as on 01-10-2018. For all other posts Written test and personal interview will be conducted. Candidates who are interested in these vacancies they can apply online before the closing date of 16-11-2018. Exam date and admit card release date, exam pattern and syllabus details are mentioned soon in the official website of www.wbpdclonline.com.